Sleep is an important factor in all our lives. When we sleep, we rest and our body is able to renew its energy. Sleep is also important because of dreams. When we dream, we process all the events of daily life. Getting a good night`s sleep therefore influences our psychological well-being. Sleeping well is often the result of having good sleeping habits, which parents should teach their children. The child`s sleeping pattern, affects the entire family. That is why good sleeping habits and rules about bedtime are important. How much sleep each person needs is up to the individual. If the child is very active and does not need much sleep, then that may not be a major problem. Do not forcibly try changing the child?s sleep patterns as it may only cause trouble. A newborn usually sleeps between 16 and 19 hours per day. She often wakes up every two to three hours to eat. Since hunger will usually wake her up, she will not normally sleep for more than four or five hours at a time. Some babies sleep more than that, maybe for eight or ten hours at a time. This is all right, provided the child is normal and healthy. How much sleep does a 3-month-old baby need ? A three-month-old baby usually sleeps between 13 and 15 hours per day. Approximately five hours of this will be during the day and the rest at night. The baby may still wake up once or twice every night. When the baby wakes up, try to make her go back to sleep. If it is necessary to feed or change the baby, do it quickly and quietly. 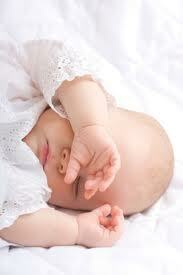 Babies don`t care whether they sleep at night and stay awake during the day, or the other way around. It is up to parents to teach them the better habit. How much sleep does a child between 6 and 12 months old need? A child between six months and one year old will usually sleep between 12 and 14 hours per day. If the child still wakes up at night, it is all right for parents to let five minutes pass before they try to make the child go back to sleep. Parents have to make sure, of course, that there is nothing wrong with the baby. In time, parents will learn to recognise the baby`s different cries when it is hungry, tired or in pain. The baby needs some reassurance and it is important to make the baby feel safe. How much sleep does a child between 1 and 3 years old need ? A child who is one to three years old usually sleeps between 10 and 12 hours per day. It is important that the child knows when it is time for bed and should abide by that routine. A pre-school child usually sleeps between 10 and 12 hours every night. At this age, sleeping routines and bedtime have become familiar. Parents must be aware, though, that at this age children may suffer from nightmares. If the child wakes up crying because of a nightmare, she needs comfort and security. If your baby is healthy, it should sleep on its back. If the baby suffers from any diseases, the doctor will advise parents which position the baby should sleep in. How much sleep does a school child need? A school child usually needs to sleep about 10 hours every night. When deciding her bedtime, it is important to bear in mind what time the child has to go to school in the morning and how long it will take her to get ready and travel to school. This way, the child will get a good night`s sleep and feel rested in the morning. If not, your child won`t get the best out of school and every morning will be a hassle, trying to get a tired child out of bed. Parents must decide on a suitable bedtime for the well being of the child. How to make your baby`s bed safe? It is recommended that the baby sleeps on a firm mattress rather than one that is very soft. The bed has to be stable and the sides and ends of the bed should be at least 60 cm high so that the baby can`t crawl or climb out. Don`t fill the bed with lots of soft toys. The baby?s pillow must be light and a suitable size for the baby. Do not let the baby have an adult pillow. This will create a danger of suffocation and is not good for the baby?s back. The room where the baby sleeps should not be too hot. During the summers, make sure that the baby is not over-dressed and be extra careful if the baby has a fever. How to prevent a crooked skull? Sleeping on their backs can cause babies` skulls to become crooked. Parents can avoid this by laying their baby?s head on the opposite side every time they put the baby to sleep. The crooked shape will gradually improve and become covered as the hair grows. It never causes brain damage. When the baby is awake and the parents are talking to her, or playing with her, she should be put on her stomach to counteract any crookedness. This is also a good way of training the muscles of the baby?s stomach, back and neck.